The Hofstra Law Deportation Defense Clinic (DDC) is in its first year of operation, but it has already made great strides in serving immigrant communities on Long Island through a combination of representation, law reform, and community outreach and collaboration. The DDC kicked off in mid-June, led by Visiting Clinical Professor of Law Emily Torstveit Ngara, who joined the Hofstra Law faculty from the Immigrant Rights Clinic at the University of Baltimore and the Immigration and Human Rights Clinic at the University of the District of Columbia. 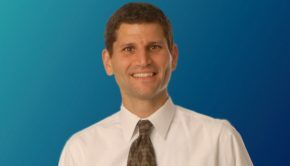 She was joined in September by teaching Fellows Roni Amit and Lissette Eusebio. And 14 students have participated in the DDC in its first academic year. The DDC immediately began assisting underserved clients with immigration needs on Long Island, providing services as of February to 46 individuals, representing 17 clients on a variety of matters and consulting with 29 on their immigration situation. The DDC has received referrals from and collaborated with several organizations on Long Island, including the Legal Aid Societies of Nassau and Suffolk counties, LatinoJustice PRLDEF, CARECEN, Make the Road New York, Empire Justice Center, and the Pan American Administrative Service. The assistance offered by the DDC covers such legal needs as challenges to detention, bond hearings, efforts to reopen final removal orders, motions to suppress evidence obtained in violation of constitutional rights, and affirmative immigration applications. The DDC has secured the release of three detained clients, and student attorneys successfully argued a bond case for a detained client. The DDC has also developed impact litigation to affect broader immigration policy and practice, launching a first-of-its-kind suit in New York State, challenging the use of ICE detainers by local law enforcement. The case, which received broad media coverage in the local and national press, is part of broader efforts in New York and nationally to challenge local law enforcement cooperation with ICE. In these efforts, the DDC has engaged with other law school clinics and legal NGOs involved in similar challenges, as well as with the New York Attorney General’s Office, which issued a legal memorandum in a similar case that reinforced the legal arguments put forth by the DDC in its case. In the areas of community outreach and collaboration, DDC students have done two Know Your Rights presentations in the community, and faculty have participated in three community legal clinics with Long Island Together and Mary Brennan Inn, a soup kitchen on Long Island. The DDC also participated in a training with Long Island Jobs with Justice for the Long Island Rapid Response Network for immigration raids. The DDC is planning a continuing legal education conference for practitioners that will focus on issues impacting Long Island immigrant communities with participants from the New York Civil Liberties Union, Safe Passages Project, and more. The DDC will also be participating in the Long Island Immigrant Legal Services Table. 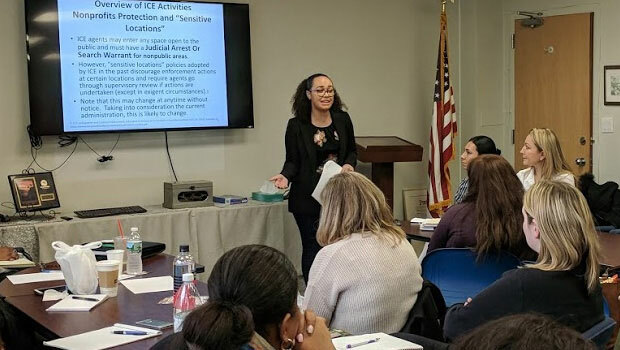 The DDC has collaborated on cases with four other Hofstra Clinics — Asylum, Criminal Justice, Law Reform Advocacy, and Youth Advocacy — and has co-counseled on cases with the New York Immigrant Family Unity Project and CARECEN-NY.